We thank Al Craigie and the whole team at SportFocussed for the exceptional coverage of the races. 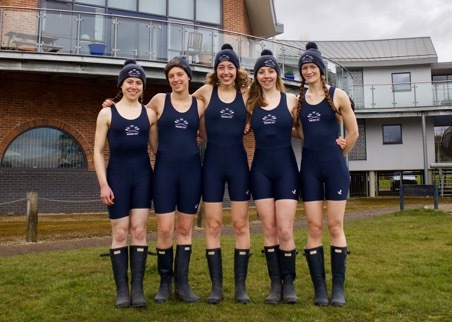 On Sunday 19th March, the Lightweight Women’s Reserve Boat Race took place, relocated to Dorney Lake from the Henley Reach at the last minute due to a poor weather forecast and high streams. For the first time at the Henley Boat Races, the Reserve Boat Race was contested by a 4+ (having been a 2- for the last couple of years). 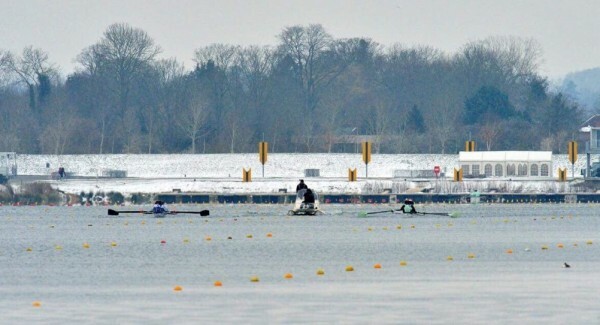 Despite the bitter weather (featuring strong, gusty cross-head winds, snow and negative temperatures) we were well prepared to race, having trained on the Dorney course in the preceding days and indeed at various points in the months leading up to the event. We had put in so much preparation and practice that as we boated and rowed up to the start, we knew exactly what we had to do at every stage. Each of us was just concentrating on the job we had to get done and trusting in our team-mates. The start was slightly delayed, due to strong crosswinds making alignment of the boats on the starting pontoon difficult, particularly for our opposition! Cambridge hit a higher stroke rate off their starting sequence, giving them an initial advantage of around a quarter of a length. Their lead was quickly swallowed up by the end of the first minute of racing, as we moved into our strong race rhythm. The magic call to bring in our hip drive really did the trick. By the 250m mark, we had a convincing lead of around 1 length and were continuing to push off Cambridge. For the rowers, it was hugely motivating to see the gap between the crews getting bigger and bigger, if somewhat astonishing! Over the remainder of the course, Jolet (our cox) stuck rigidly to our race plan, pushing us onward through each stage of the race and focusing on keeping the boat moving as efficiently and quickly as possible despite strong gusts and changing conditions along the course. 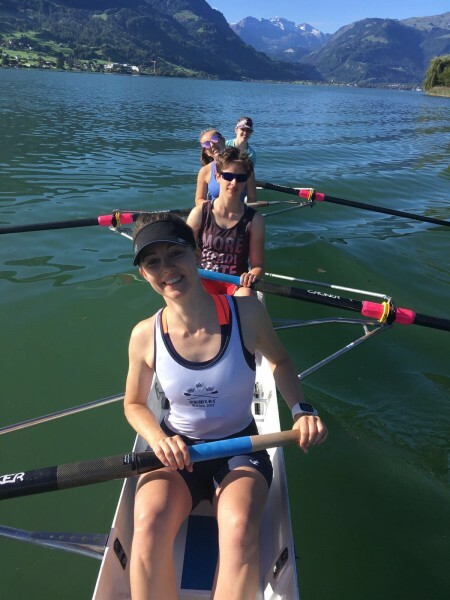 From her spot in the bows of the boat, Jolet had no idea how far our lead had opened out, so kept encouraging the four rowers as if Cambridge were right there behind us. We crossed the line in a time of 8 minutes and 15 seconds, approximately 25 seconds ahead of Cambridge. Although we hadn’t been pushed by the Tabs as hard as we had expected, it was an immensely satisfying race, and the feeling of elation was something to remember for a lifetime. 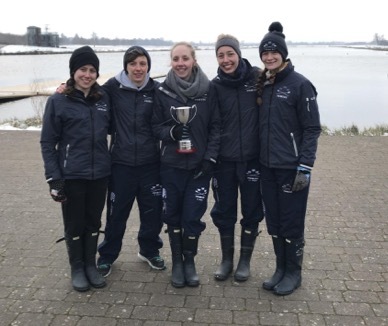 It was an honour to be the first crew awarded the trophy for the Women’s Reserve Race, which was generously donated this year by previous competitors from both Oxford and Cambridge crews. The crew would like to thank the coaching team (Chris and Clive), in particular Jill Betts, for all of their tireless work and dedication to getting us race ready. 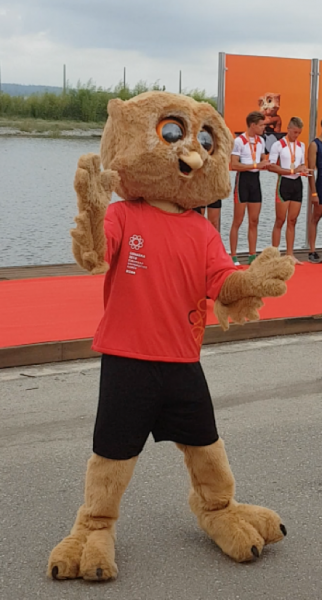 In addition, we would like to extend our thanks to our nutritionist (Jasmine), physio team (Caitlin, Briony, Sally and Nick), sports psychologist (Heather), physiologist (Filipe) and the entire HBR Organising Team for their work arranging the racing at Dorney under difficult circumstances. Verdict: Oxford win, ‘easily’ in a time of 8 min 15 sec. Spectators huddle in small groups, stamping their feet on the frozen ground. 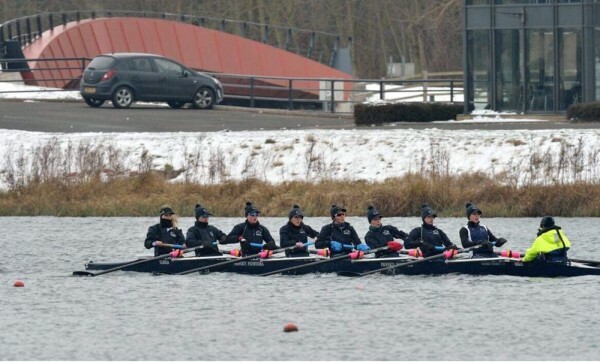 Only the most dedicated supporters have braved the snow and wind to cheer on their favourite Blues at the 2018 Henley Boat Races (at Dorney Lake). Oxford are ready. They back onto the start line and point their bow expertly. The wind swings the two crews around, and they’re off—Oxford charging ahead with the quickest start of their season. As the crews settle to race pace, Cambridge edge into a two seat lead, but cannot escape from Oxford who have found their rhythm. Down the course, the two crews battle for dominance: Cambridge make a push and get almost a length ahead, but Oxford strike back and reclaim the seats until the crews are back where they started. With Cambridge still holding on to their two seat lead, Oxford goes all in—they sprint early and it’s a wild chase to the finish, rates spiralling higher and higher. At the last moment, Cambridge surge forward another two seats and cross the line half a length ahead. The verdict: 2 seconds. Defeat is bitter, but we rowed the best race we could have on that day. We have no regrets, only next year to look forward to. “Adverse river conditions on the Thames at Henley have made it necessary to relocate the 2018 Oxford & Cambridge Lightweight Boat Races. The management at Eton Dorney have kindly agreed that racing may take place at Dorney Lake. Due to limited parking at Dorney, we recommend travelling by train. London to Slough is direct and <20mins. Oxford to Slough is direct and >30mins. Taxi from Slough to Dorney takes 15mins, and will cost £5 each, if shared between 4. We look forward to seeing you there! Christmas 2014: an unexpected message in my inbox. OUWLRC needed an extra cox for training camp, did I want to go for it? I (eventually) decided that I fancied it, but on the strict, self-imposed condition that it wouldn’t lead to any long-term commitment. 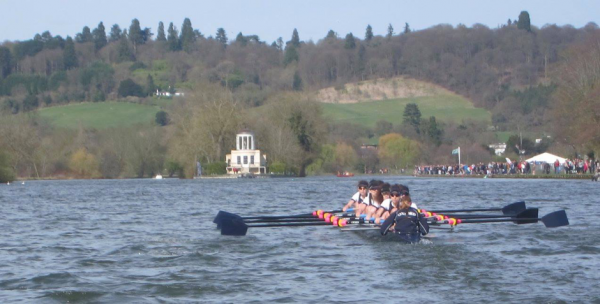 A whirlwind of a year later, my crew snuck their bowball ahead of Cambridge’s at the Henley Boat Race 2016 to pull off an incredibly last minute win by a canvas. Then I graduated, feeling certain that my experience of the real world would be much more land-based and much less on the water. However, OUWLRC left such an impression on me that I wasn’t ready to let it go. I messaged anyone I thought might be able to help and told them the same thing: I wanted to cox for GB. A massive long shot, but I’d do whatever it took to give it a decent try. I didn’t know that would entail upping sticks to London, blowing every penny left in the bank on a flat with strangers, setting alarms for 3:50am to trek from Putney to Molesey for outings before dashing from zone 6 to 1 for 9am lectures at law school. Trying to get on the radar, racing with any crew that asked me, even putting myself in front of busy GB coaches and eagerly introducing myself. One morning my coach at Molesey told me the GB para squad were looking for coxes, and that they’d put my name forward if I wanted to trial. I told him to count me in. 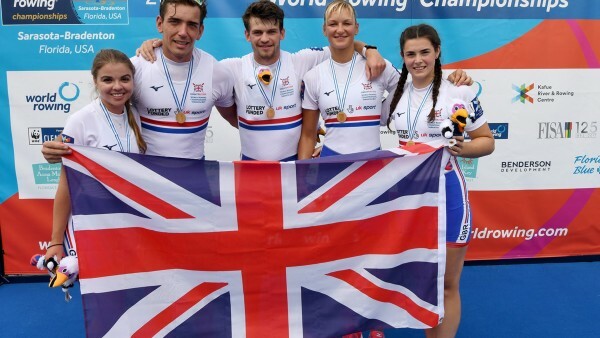 It hit home that the 2017 World Rowing Championships were happening when, just after we touched down in Florida, the pilot wished luck to the GB Rowing Team over the tannoy to a cabin full of passengers who burst into applause. In Tampa, there were posters and billboards for the event everywhere. Everyone greeting us in the airport was full of energy, excited that GB had arrived – one of the first nations to come through. Watching other teams from all over the world gradually join us one by one at the Nathan Benderson Park was surreal; as the boat racks filled up I made the transition from deciphering Oxford college blade colours to working out which countries were training in the lanes around us on the lake. When, during the colourful opening ceremony, the 69 competing nation flags were brought onto the stage, it reinforced what a privilege it was to be there and what an amazing week lay ahead. Base camp was the Hyatt Regency Hotel in Sarasota – second to none with our 9th floor balcony views of the marina and Gulf of Mexico. Most of our time away from the lake was spent recovering here, with our fantastic team coaches/doctor/physiologists/physiotherapists/nutritionist no more than a few doors away if we ever needed support. 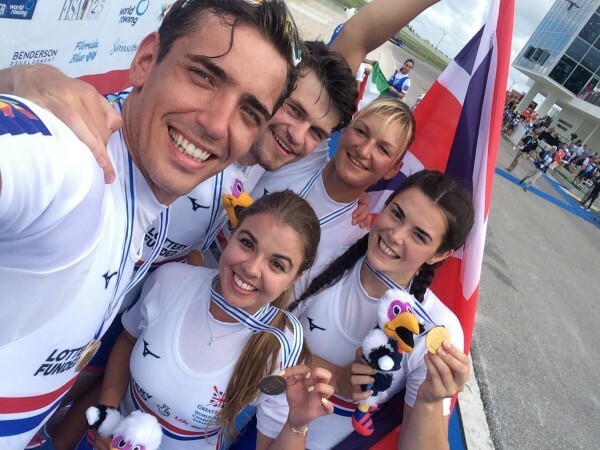 With our preliminary scheduled for five whole days into the regatta, it was exciting chatting with other GB athletes over meals and hearing their accounts of how racing was going. Our final came around on the morning of Saturday 30th. Despite a good preliminary two days previously we were ready to step up another gear and adamant not to rest on our laurels. We’d been told the day would be a “19-camera-extravaganza”, and that tickets had completely sold out; nonetheless everything that morning seemed to happen perfectly within our own crew. I wasn’t as nervous as I thought I’d be, as we’d been so well prepared in the lead up to the race that we knew exactly what the plan was and how we were going to deliver it. Auto-pilot kicked in from the minute we pushed off the raft. We were given a bit more of a fight off the start compared with the preliminary race; it was important to stay internal and execute our start sequence exactly as we’d planned it. 500-600m in, as we pulled away from the USA, the challenge was to see just how clean, efficient and technical we could make the rest of the race. We knew what splits to look for and which technical points we’d need to stay on top of to hit them. By the time the red buoys came it felt as though we’d set a sustainable platform to build for the line. Seeing the bubble-line getting closer and closer whilst hearing the sound from the stands was amazing. Everything after that was a bit of a blur: landing, getting ushered into the media area, hugged by Dame Katherine Grainger and Sir Steve Redgrave, trying (and tremendously failing) to keep my cool on camera…learning that we’d achieved our aim, 6:55.7, a sub-7 minute world record. Then standing on the podium and hearing the national anthem – the absolute nail in the coffin RE any semblance of media dignity as I bawled my eyes out. After that it was an immense privilege to be able to spend the rest of the weekend in the stands with the team, watching everybody else race. Back to OUWLRC. I took lessons learnt with the lightweights onto the start line last Saturday, not least every month beforehand in the build up. Back in 2015, when, inexperienced as I was, OUWLRC decided to give me a chance, this club taught me a few of the most important things: shoot for things beyond your reach. Take even the least expected opportunities. Work hard, take what luck you can get and do whatever you can to make the rest for yourself. I am so grateful for all of the support that OUWLRC has given me since I trundled confusedly into Heathrow on Day 1 – thanks especially to Chris, Jill, Clive, Andrew and all of my squad members over the last few years. You’ve made the journey incredible! Thanks also to Phil Bourguinon and everyone at Molesey Boat Club, and last but absolutely by no means least our fantastic coaches Nick Baker & Tom Dyson, everyone working behind the scenes on the GB Rowing Team for all of their hard work getting us to the start line, as well as the National Lottery for the ongoing support. 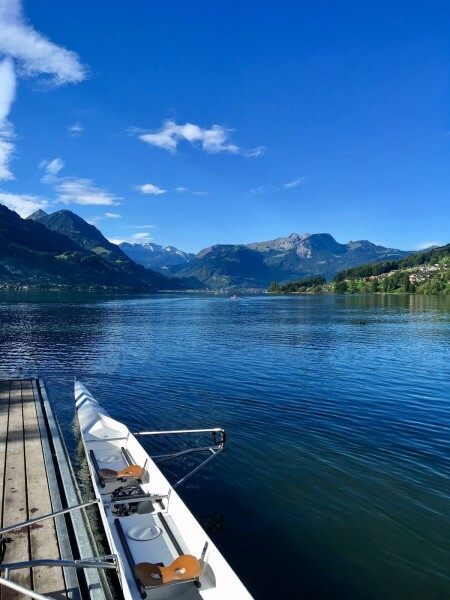 Following the success of the 2016 pre-season training camp, we returned to Lake Sarnen in Switzerland with a mixture of returning athletes and a selection of new recruits from our summer development squad. Although we were greeted with pouring rain on the first day, which made for the first character-building moment of the season, the sun eventually burnt through and the weather was generally mild with scattered showers, which made for perfect rowing conditions. The focus of this camp was predominantly working on technique. 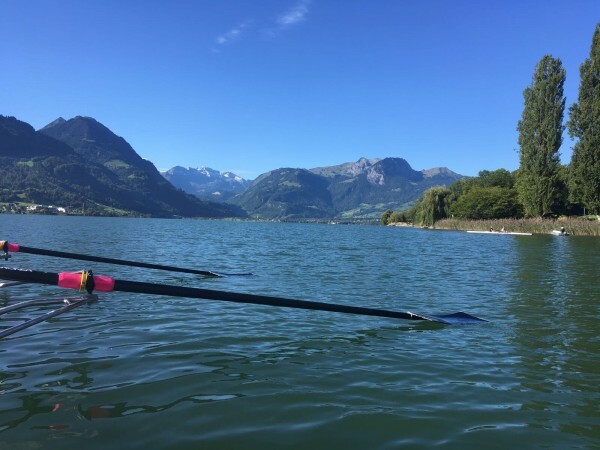 A number of our development squad athletes had never sculled before, and it was a great opportunity to learn new skills in single and double sculls as well as work in pairs and fours, and great progress was made by the whole squad in just five short days. 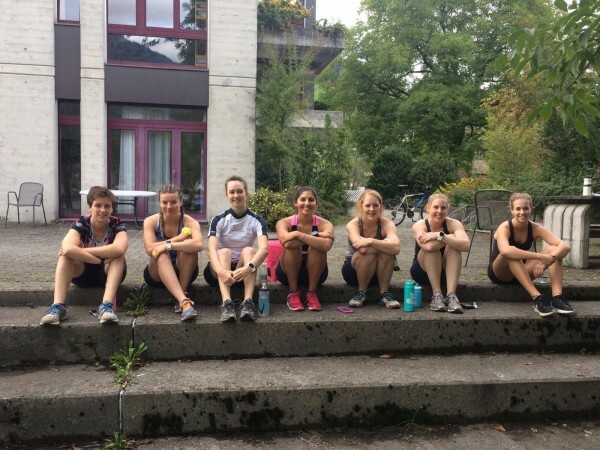 We were coached by Chris and assistant coach Jill and also accompanied by former VP Laure Bonfils (our gym bootcamp leader) and our squad nutritionist Jasmine. We had 2-3 outings and/or land training sessions per day, as well as video analysis sessions and talks educating us on the importance of nutrition and recovery, boat maintenance and what to expect during the approaching season. Jasmine also did an amazing job of cooking for the squad and bringing plenty of supplements for us to sample. This five-day training camp provided a highly valuable, focused environment for the athletes before the season commences with the whole squad. We are hugely grateful for the hard work and commitment of the coaches and Jasmine in organising this camp and helping us gain the most from this trip, ensuring we are in the best possible position for the upcoming Henley Boat Races. 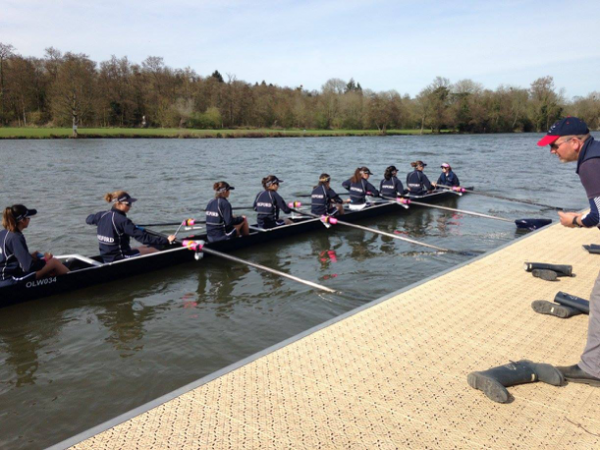 This year we had a large number of the squad compete at BUCS regatta in Nottingham from 29th April – 1st May. On the Saturday, we competed in both the Lw8+ and Lw2x categories. 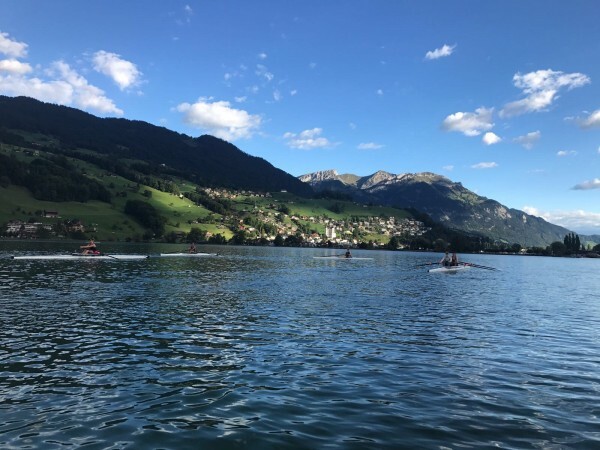 In the lightweight double Christina Turner and Ellie Watts successfully qualified for the semi-finals, despite only learning to scull 3 weeks ago, they finished 12th overall. 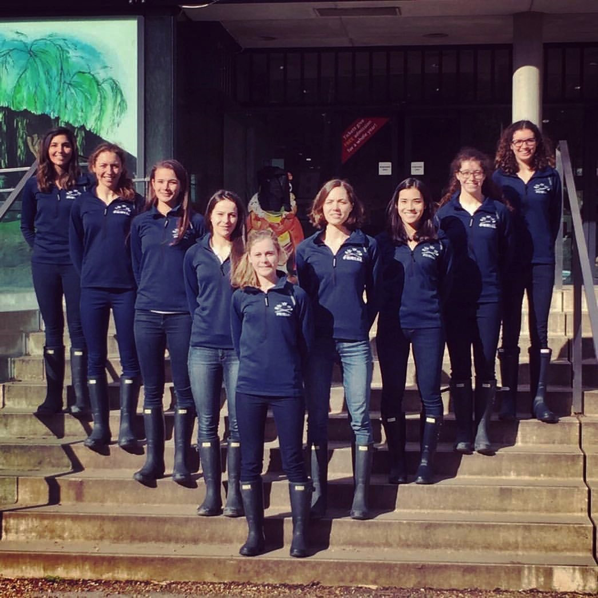 The Lw8+ consisted of this year’s blue boat plus super subs Maline Meiske and our very own coach-turned-student Jill Betts. Although they faced close competition from Exeter, they put in a strong push in the last 500m and went on to win the race by about a length! 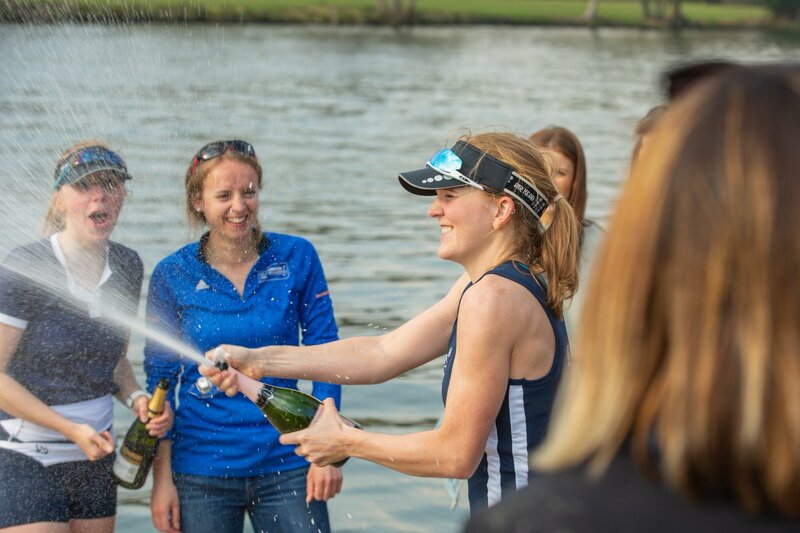 As well as winning gold, this also meant that the ladies who participated in the boat race now fulfilled the criteria for full blue status! On the Sunday, two Lw4- competed. Although both qualified for the semi-finals, neither managed to progress to the A final, the B crew missed qualifying by just 0.7 seconds. 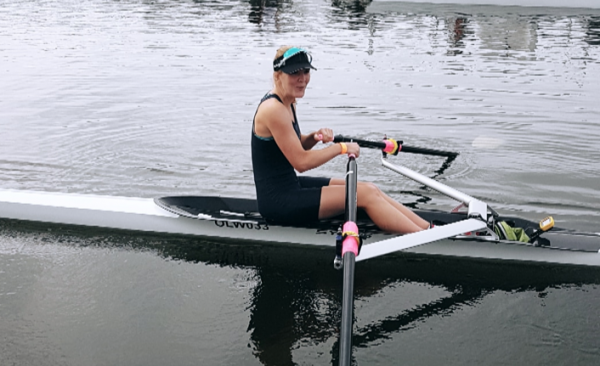 Jo Heymann also entered the Intermediate Lw1x category and won her B final. Dani Edmunds went up against the best lightweights in the country in the Championship Lw1x, she put in a strong performance, qualifying for the Championship A final, where she finished in 6th place. On the Monday, Rachel Anderson and Moyo Tian entered the Lw2- category and successfully qualified for the A final, finishing in 7th place. 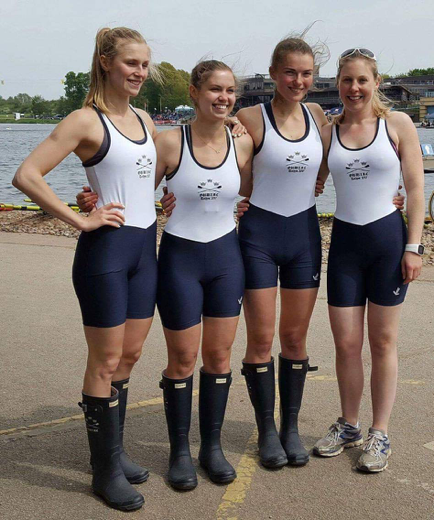 Despite only training together twice in full combination the 4+ (made up of Linda, Livia, Lise and Tuuli) finished 7th out of around 50 entries, a fantastic result! Overall, we all gained valuable racing experience and are very much looking forward to our summer of pot-hunting! Many thanks to Jill, Andrew, Chris and Clive for all their coaching and support of the athletes during the regatta. 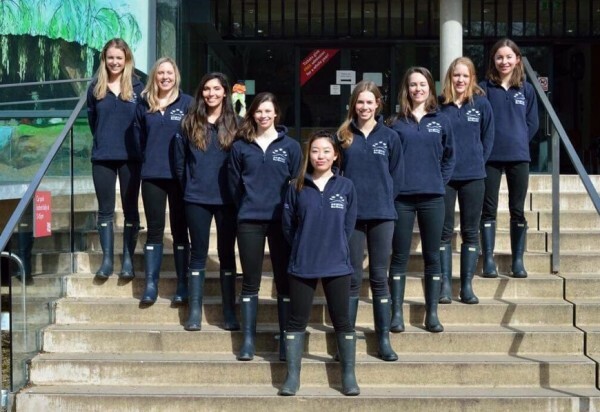 The weeks leading up to the Boat Race are a blur: crew selection – Wimbleball training camp – finishing touches in Wallingford, and then before we knew it we were in Henley: 8 rowers, 1 cox and the reserve pair. 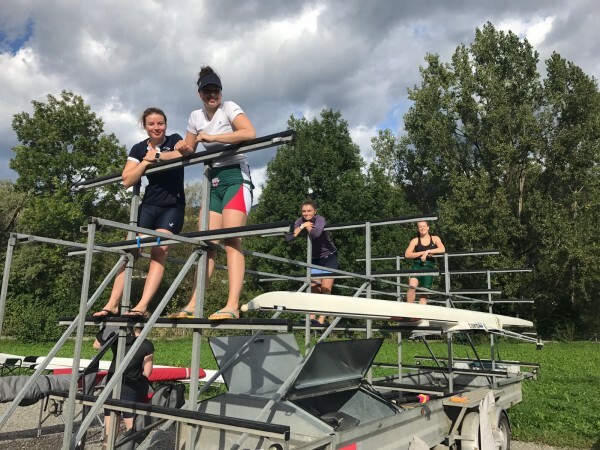 We spent a successful week adjusting to the strong headwind the Henley course had thrown at us, leading to some adjustments to rowing technique to cope with the rougher waters. Armed with our new Resolute, newly named ‘Inverbroom’, we ended the week with quiet confidence and determination. When Boat Race morning arrived, there was a feeling of readiness – we had done all we could up to this point, now it all came down to getting the final job done. The course greeted us with slightly kinder conditions than we had spent the week preparing for, with the wind slowing to a slightly weaker cross-head wind. The morning went by quickly and suddenly the race was upon us: hands on – past the crowds – boat on the water – “pushing off on three, ready: one, two, three”… After a solid warm up, with some good confidence-boosting bursts and starts we felt ready to go. We were aware that Cambridge had a strong line up, but we were so focused and internalised it didn’t cross our minds that we might lose this race. Both crews attached to the stake boats quickly, but getting (and remaining) straight was a struggle in the crosswind, which had picked up throughout the day. I heard the Cambridge cox, repeatedly: “my hand is down”, just as my own bows swung around in the wind. As I was straight, I heard the Cambridge cox: “my hand is up”. We finally synchronised and the umpire quickly called the start: there was no time to think. We produced a solid start and went off the stake boat cleanly through the waves. Cambridge’s start was simply stronger and they pulled ahead. I called an ‘absorb’ move to hold strong coming off the start, but not one eye strayed from our boat; we all had confidence in each other. Between the 500m mark and the Remenham club, Cambridge’s clean, composed rowing extended their lead when we came past our supporters at Upper Thames. We stuck to the race plan and I called our focus on sharp catches approaching Upper Thames, and combined with the effect of the support from the Oxford crowd we finally found our rhythm and started to move. Cambridge were now well ahead and it was at this stage coming up to halfway that I knew we had to do something special to narrow the margin. Rather than a power push, I called our wind for the finish early: the rowers knew this could happen at any stage in the race and I was so proud of the response they gave. We took the rate up three and started to narrow the margin for the first time. We knew we were behind, but not once did I see or feel anyone in the boat give up and it was amazing to find our rhythm and lock onto it. This transition, coupled to a final successful wind into the finish at 500m to go saw us narrow the margin to three lengths at the finish. It would be so easy to judge the success of this year on the margin of this loss and reflect on what we could have done better as a crew and as a squad to change the outcome. There was a lot to be learned from this race, but although it is hard to admit, Cambridge simply put out a better crew of 9 people and rowed the better race. They deserved this year’s win, and I commend the race they produced. 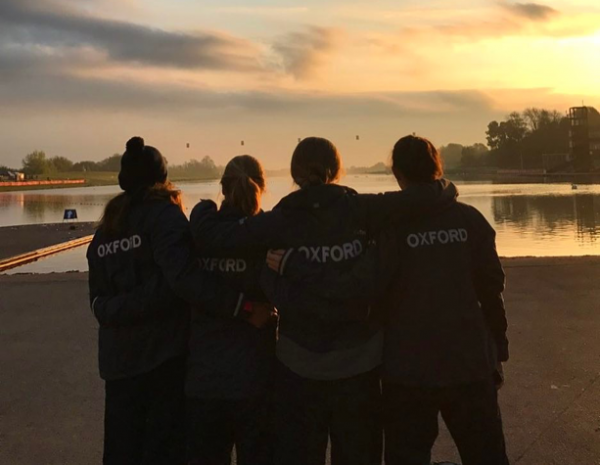 Regardless of the outcome, for any athlete to juggle training for a Boat Race with a full academic schedule is something to be admired, and I am in awe of my rowers every erg test and training session they put themselves through, for months on end, coming back year on year. Yes, we lost the boat race and that hurts, but we have also come so far as a crew. I can honestly say I have never experienced such camaraderie, determination, and complete commitment to each other and a mutual goal, and I am so proud to have been part of this group of amazing athletes.